One-dimensional hollow hexagonal ZnO rods (1-D HHZRs) were grown onto the SnO2: F (FTO) coated glass substrates by using two-step deposition techniques. Initially, the ZnO seed layer was coated onto the FTO which was followed by hydrothermal route in order to grow 1-D HHZRs. These 1-D HHZRs were decorated with Eosin-Y dye and CdS semiconductor nanoparticles (NPs) by using a chemical routes like dip coating and successive ionic layer absorption reaction (SILAR) technique, respectively to improve its photoelectrochemical (PEC) performance. 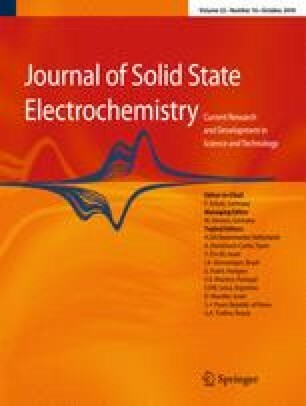 The structural, morphological, optical and electrochemical characterizations of the thin films were analyzed by various sophisticated instruments. X-ray diffraction (XRD) pattern corroborated the phase formation of ZnO and CdS with the hexagonal and cubic crystal structure, respectively. 1-D HHZRs films were obtained by scanning electron microscopy (SEM) with rod diameter of about 1.47 μm. Furthermore, SEM image clearly showed the CdS NPs covered 1-D HHZRs. The direct optical bandgap energy of the samples were estimated to be 3.28, 3.24 and 3.03 eV. CdS NPs-sensitized 1-D HHZRs samples showed hydrophilic nature for water contact angle, which is advantageous for the better improvement in the PEC performance as compared with pristine and dye-sensitized 1-D HHZRs. A correction to this article is available online at https://doi.org/10.1007/s10008-019-04248-y. The authors PSP and SDK are very much thankful to the University Grants Commission (UGC), New Delhi, for the financial support through its project No. 43-517/2014(SR).